Theyare back! The fictitious LaPierre-Menard family, celebrating their family reunion and, of course, the traditional telling of the family stories to an audience of an incoming generation of young boys! 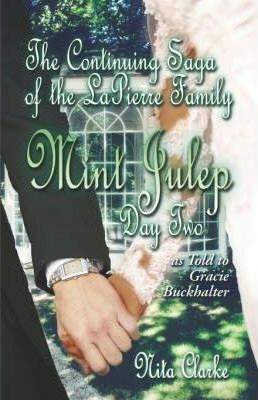 Grab yourself a chilled mint julep, stick a fresh magnolia blossom in your hair and sit yourself down in a quiet place to enjoy The Continuing Saga of the LaPierre Family, including Dolice Marie and Jean Pierre LaPierre with all of the other wild characters from Mon Village, on the Bayou Frou-Frous. Youare invited to a wedding, but whose wedding will it be? Find out as you follow the frolics of Angeline, Miss B B Carson Declouette and Obadiah, as well as all of the lovely ladies doing business at the New Orleans House in the great city of New Orleansa]if you know what I mean. Follow Jubil down a trail smothered on either side with that pesky mint, all the way to the noble Commonwealth of Kentucky where he slams head-on into history! And meet all of the brand new characters and all narrated by Alexandra Menard LaPierre, as told to Miss Gracie Buckhalter. And nowa] Laissez le bon temps rouler!